Structures! Here are some great fiction and nonfiction titles to launch the Grade 3 science unit. Going Up! 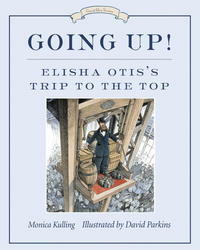 Elisha Otis’s Trip to the Top, a picture book by Monica Kulling, illustrated by David Parkins, will inspire young inventors. As a Vermont farm boy in 1818, Otis was intrigued by the ropes and pulleys hoisting hay up to the barn loft. As a grownup, he invented a platform to lift heavy machinery parts. He then moved onto elevating people, but the public were mistrustful. So he demonstrated his innovative safety brake in dramatic fashion at the New York World’s Fair. Otis’s invention made skyscrapers possible. 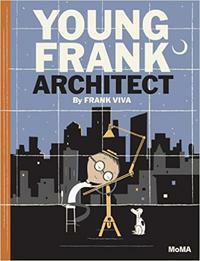 Young Frank, Architect, by Frank Viva, features young Frank who loves to design chairs, buildings, and whole cities out of books, toilet paper rolls and found objects. After a visit to the Museum of Modern Art with old Frank, the two of them collaborate on even loftier creations. 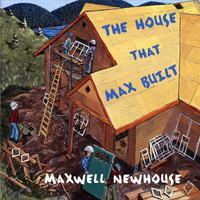 The House that Max Built, by Maxwell Newhouse, features Max building a house on a lake. Simple, yet detailed pictures, show each stage of construction, from architect to framing crew, brick layers to plumbers, drywallers to gardeners. There’s a descriptive job list at the back. 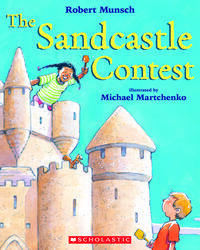 The Sandcastle Contest, by Robert Munsch, is pure fun. Michael Martchenko’s playful illustrations show Matthew and his family going camping with everything, including the kitchen sink. At the beach, Matthew encounters a sandcastle-building contest, with a bathtub full of ice cream as the prize. Matthew’s sand house is so realistic, the judges challenge its authenticity in a very destructive way. The nonfiction book, Look at That Building! 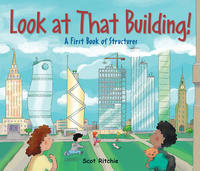 A First Book of Structures, by Scot Ritchie, reads like a story, following five friends who decide to build a doghouse. They head to the library to research and along the way notice all that goes into a building—a nearby construction site’s foundation; animal homes; school walls; the fire station’s windowed doors; bus shelter columns; library ceiling beams. It ends with a procedural text of how to build a simple model doghouse out of toothpicks and marshmallows. Build It! 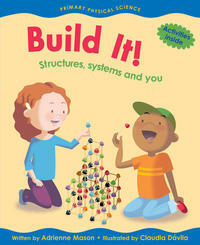 Structures, Systems and You, by Adrienne Mason, illustrated by Claudia Davila, is a good intro to structures and what makes them strong. The reader is challenged to find structures in cartoon-like illustrations, followed by a step-by-step activity demonstrating each facet of building, such as joining, layering, twisting and folding, and stable shapes. 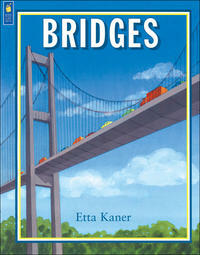 Bridges, by Etta Kaner, illustrated by Pat Cuppler, is a great resource for teachers. Provided is a description of various bridge styles, each with an illustrated step-by-step experiment to test its strength and capabilities. The book explains bridges of various lengths, bridges with beams, box girders, piers and reinforced concrete, as well as cantilever, covered, truss, arch, suspension and moveable (i.e. bascule, swing and vertical lift) bridges. It’s written in an inquiry-based way, interspersed with jokes and challenges. 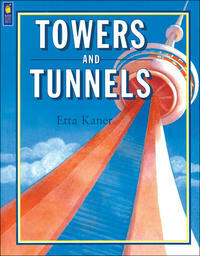 Towers and Tunnels, also by Etta Kaner, illustrated by Pat Cuppler, is similarly informative (and a quick lesson for teachers) about soil-testing, laying foundations, frameworks, wind effects, elevators. There are case studies of the Eiffel Tower, the CN Tower and a few other famous towers. The tunnel portion of the book offers experiments which demonstrate how to overcome specific problems, i.e. boring through rock, building underwater, reducing pressure in the Eurotunnel. 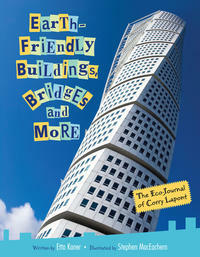 A past Silver Birch nominee, Earth-Friendly Buildings, Bridges and More, again by Etta Kaner, illustrated by Stephen MacEachern, blends Kaner’s two previously mentioned books, featuring some of the same experiments, but with more real-life examples. 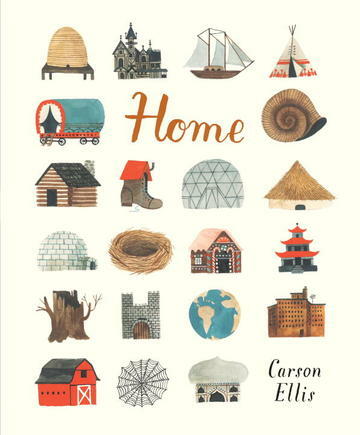 The narrator, Cory Lapont, daughter of world-travelling engineers (featured in her other books) has created this "scrapbook," filled with photos and fact boxes, about skyscrapers, bridges, tunnels, domes, dams, dikes, locks and levees. 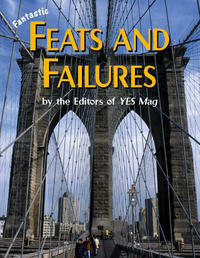 Fantastic Feats and Failures, by the editors of Yes Magazine, also a past Silver Birch nominee, contains two-page spreads showcasing real-world structures that turned out to be successful or disastrous. Feats include the Sydney Opera House, the Eurotunnel, Panama Canal, Canadarm. Disasters include Chernobyl, the Challenger. Both feat and failure: leaning tower of Pisa, World Trade Centre. The following two fantastic series for this age level are perfect for independent research. Canadian Structures, by True North (Beech Street Books) by various authors, provides simple explanations of forces at work in longstanding structures. 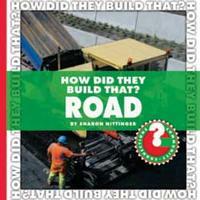 Titles include: Bridges, Roads, Skyscrapers, Stadiums, Towers, Tunnels. The format is always the same: structure's purpose; how it was built; forces involved. 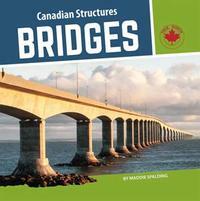 Each brief chapter illustrates a famous structure somewhere in Canada, with fair representation across the provinces. Diagrams show concepts such as compression, tension, and shear load. Each book has bolded text, glossary, and some inquiry questions. How Did They Build That? (Saunders Book Co.) by various authors, includes the following titles: Road, Bridge, School, Skyscraper, Stadium, Tunnel. This series has little discussion of forces but is a more detailed step-by-step discussion of how to build each generic structure. It also has photos, bolded text, glossary and further resources. 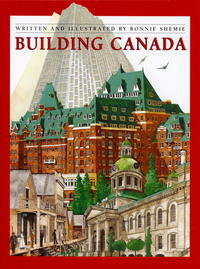 Building Canada, by Bonnie Shemie, is a visual timeline of architectural styles beginning in New France and ending in the year 2000. Detailed labelled watercolours, are accompanied by descriptions of why and how different styles developed (ending with First Nations' buildings), complete with glossary of architectural terms. 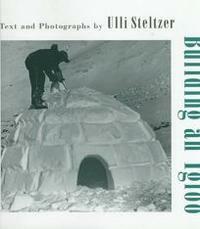 In Building an Igloo, by Ulli Steltzer, black and white photos illustrate the story of hunters Tookilkee and son constructing an igloo. They begin with locating the right snow, cutting it with a saw, laying the large rectangles in spiral formation, and completing it with chimney, window and porch.